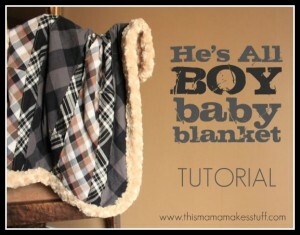 I saw this absolutely adorable baby boy blanket tutorial on Pinterest a little while ago. Instead of flannel shirts (which is a fantabulous design element), I used flannel fabric in three corresponding colours; about half a meter of each. 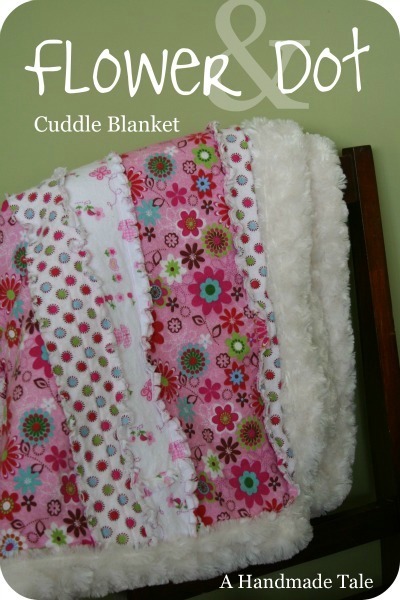 You'll also need one meter of cuddle or minky fabric and cotton quilt batting. 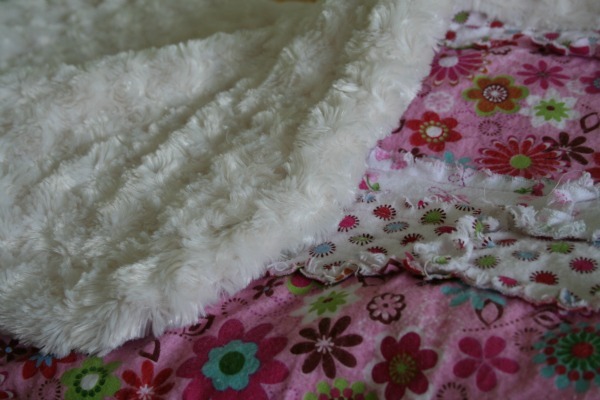 I used Warm and Natural in the Baby/Crib size, which is 115 x 150 cm (45" x 60") and needed to be trimmed down a bit. The top of the quilt is done in a striped rag. 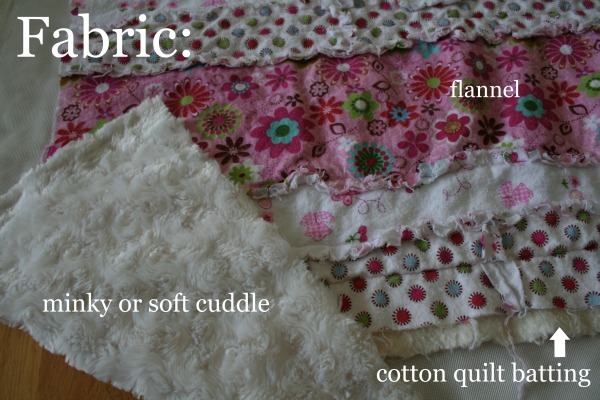 It's not a full-out rag quilt; just one layer of flannel was sewn (wrong sides together!) 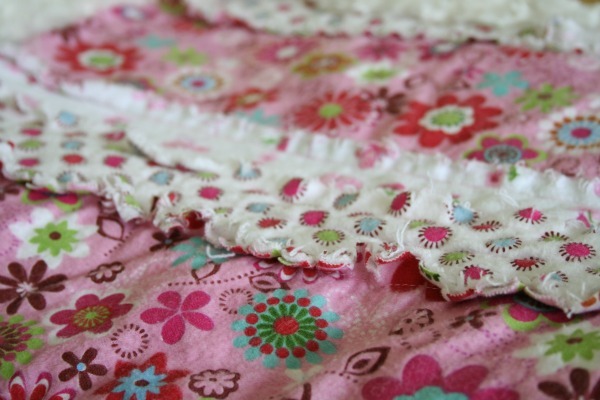 with a 1.5 cm (1/2 inch) seam allowance. The flannel was sewn to the cotton batting down the middle of several stripes. I laid the blanket top on the cuddle fabric with wrong sides together and cut the cuddle fabric 6cm (2") wider and longer than the blanket top. To round the corners, I used this uber sophisticated device called a bowl. Get yer straight pins! You'll need a whole whack of these for the next step: edge folding. 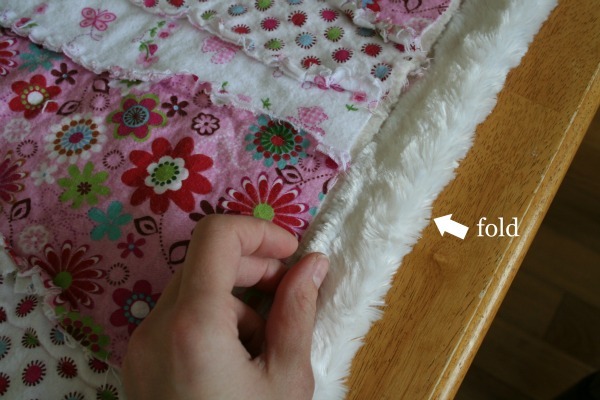 Fold the cuddle fabric in towards the blanket top 2.5cm (1"). 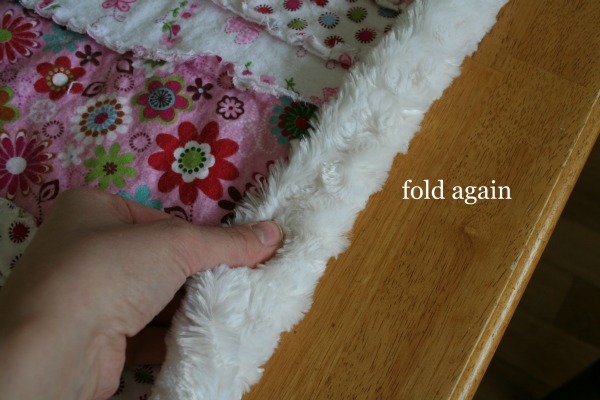 Fold again the same amount so that the cuddle fabric is overlapping the edge of the blanket top. Pin all the straight edges this way. Find the center of the rounded edge. It doesn't have to be exact...just guesstimate. Fold (as per the straight edges) and pin. The diagram above is either going to tick you off or help you. I hope it's the latter. The center fold that you just did is number 1. Move to either the right or left side (number 2) of the center. 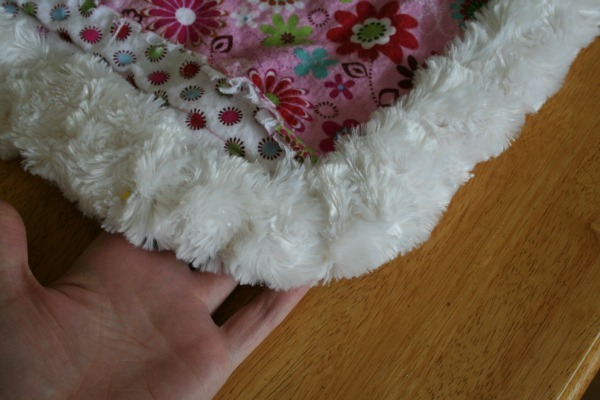 Fold the fabric (as per the straight edges) and make a little tuck towards the center and pin. Complete another tuck (number 3) and pin. 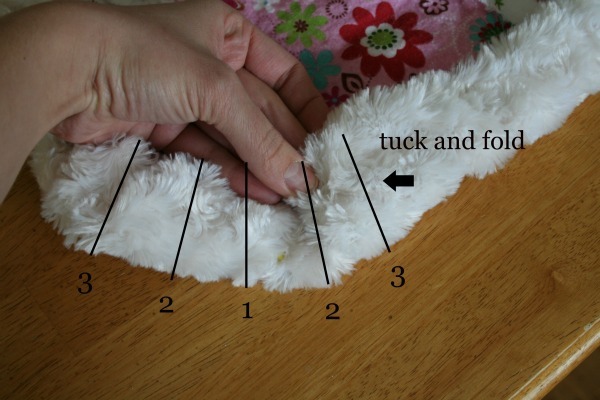 Do the opposite side in the same way, making sure to tuck towards the center. 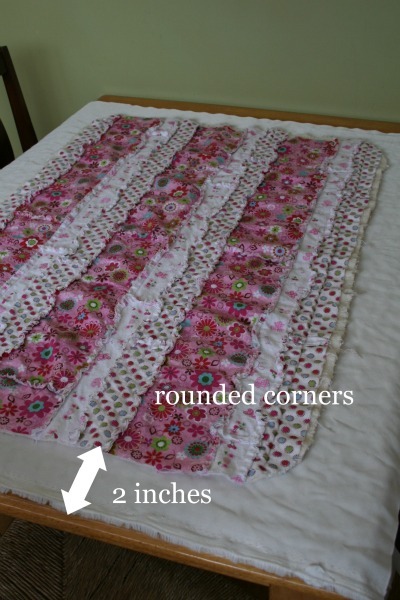 Repeat on all three remaining corners and you should have something that looks like this! 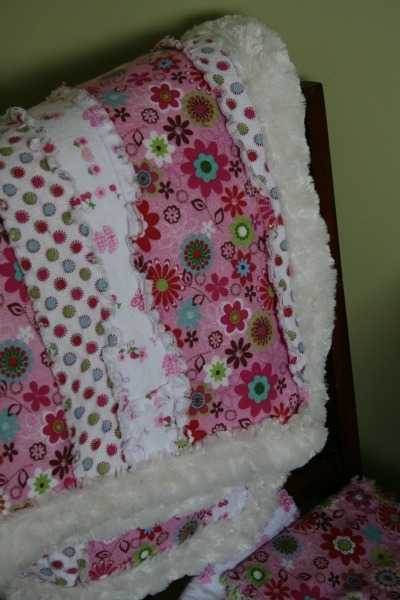 The last step is to sew around the cuddle fabric edge (see the 'He's All Boy' blanket tutorial for this). 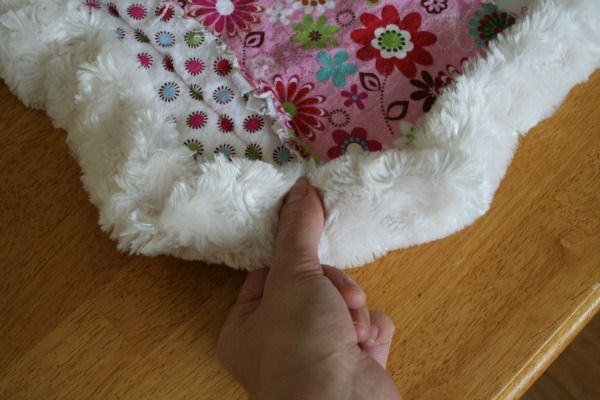 While sewing, be sure you're catching the fabric itself and not just the fluffy bits.